Although the chlorofluorocarbons (CFCs) used in its air conditioners are blamed for the growing hole in the Earth's ozone layer, the Carrier Company was first to produce a chlorine-free, non-ozone-depleting residential air-conditioning system. An engineer from the Northern U.S. invented the air conditioner, a device that would revolutionize working environments -- and forever change life in the Southern states and other places with hot, humid climates. 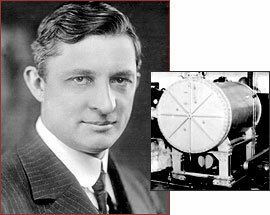 In 1902, Willis Carrier patented the air conditioner, a device that would impact factory productivity, building design, population trends, and, ultimately, the growth of cities. He was born in 1876 in Angola, New York, and worked his way through Cornell University, studying mechanical engineering and earning a master's degree. His first job was at a heating company, where he worked on commercial heating systems to dry goods like coffee. Frustrated by the state of engineering knowledge in his field, Carrier collected test data, making discoveries that immediately improved heater design. When his data tables started saving the company money, he was promoted to head of experimental engineering. Attempts to create a cooling machine had been made in the past, but most were just ventilation schemes, and none had been successful. In 1902, Carrier designed a mechanical humidity controller for a printing shop in Brooklyn. The system passed air through a filter, then over coils containing a coolant (the same basic design persists in air conditioners today). Once Carrier's device removed humidity from the workshop, the printing inks stopped bleeding and running. The client was overjoyed. Another customer, a South Carolina cotton mill, also benefited from Carrier's technology, which cooled its burning-hot spindles. As he worked with an ever-growing list of commercial clients, Carrier fine-tuned the technology behind his apparatus. He founded the Carrier Engineering Corporation in 1915. Slowly air conditioning made its way from factories into hotels, theaters, stores, and other public places. Soon after the Second World War, the nation experienced a construction and consumer boom that put home air conditioners on the must-have lists of many Americans. The spread of artificial climate control in the second half of the 20th century triggered major, long-term demographic and architectural trends. Sun Belt cities like Atlanta, Georgia, and Houston, Texas, boomed, attracting businesses and workers by the thousands. House design shifted from features that facilitated natural cooling -- porches, high ceilings, cross ventilation -- to spectacular additions like glass doors and large windows. And iconic, modern glass-walled skyscrapers rose across the nation. Carrier died in 1950, but his company is still the major producer of cooling equipment today.